I think you’re great! Let me explain why. There’s about a 50% change you’ve visited this blog before, so I think it’s safe to assume this is not the first post you read. That means you’re one of the people who helped to make this blog go from a couple of hundreds of visits a month to – recently – over 2,500. Cool! Over 7,000 unique visitors from more than 100 countries came to this blog in twenty-ten. Among you are quite some of the people whose work on innovation in the cultural sector I greatly admire. Thanks for joining. The discussion about the future of culture and museums is happening on many blogs, forums and conferences. Mine is just a small one. The past year has given us many moments where the international community for cultural innovators came together. I think about the ash cloud unconference sessions after Museum and the Web, the comment section of Nina Simon’s ever great blog and events such as #followamuseum and #askacurator (thanks Jim!). Jim Collins wrote one of the books that have shaped my vision on life and work, Good to Great. If you haven’t done so before, pick up a copy and memorize it. It’s gold. One of his points is ‘first who, then what’, another the flywheel. What Mr. Collins proves is that if you get the right people together, and you make sure you work on something you really like, can be the best of the world in and earn a sustainable living while doing so, a flywheel will start turning. When you are persistent in doing that thing, the flywheel will get momentum. This momentum makes the impossible possible and will turn whatever you do from merely good, to great. I believe in 2010 we’ve been pushing the flywheel quite a lot. I believe we’ve started to reach the point where the flywheel gives back more energy than we put into it. Okay, so I’m still relatively new to this game (19 months in the sector and counting). Maybe I’m wrong. Yet, I believe that among us, readers of this blog, visitors of (international) conferences, hard-working museum professionals, there’s a core of people who can really change this sector for the better. And I believe 2011 might be the year to do so. Keep pushing the flywheel. Keep changing the way we think and work. I believe we can turn museum from good to great. That’s why I think you’re great. You’ve been pushing this flywheel last year. You’ve (probably) been doing so for years. It’s your energy that benefits us all. Thank you! Twenty-ten for me has been the year to get to know a lot of people, learn a thing or two, and do some projects to get hands-on experience with innovating culture. Thanks to my amazing colleagues at the Museum of National History, I had the opportunity to work on some cool projects, such as Nieuwe Groeten Uit…, the National Vending Machine and our new website. There’s a lot I learned from that. 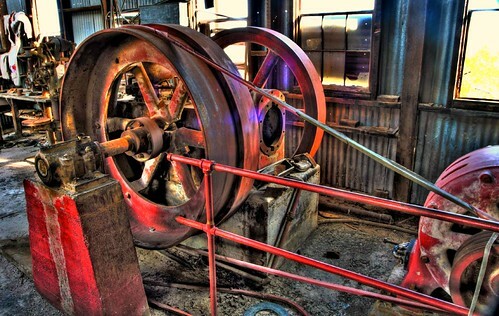 Next year, 2011, I hope to use the energy of the flywheel and the knowledge of the past year in many projects that will be inspirational to others. Do (more) stuff. And tell about it to share the energy and knowledge. Write more posts (I’m planning on 80), give presentations and host workshops. Make culture, heritage and museums relevant and accessible to more people. Chris Guillebeau, whose wonderful book The Art of Non-conformity I’ve recently read, asks in a recent post on his blog for a year’s theme. I’m not sure, but I guess mine will be ‘show it’s possible’. Show that it’s possible to build great museums, expositions and activities. I’m curious about your year’s theme. Have a great 2011, hope to see you soon online or at some conference and thanks again for 2010!